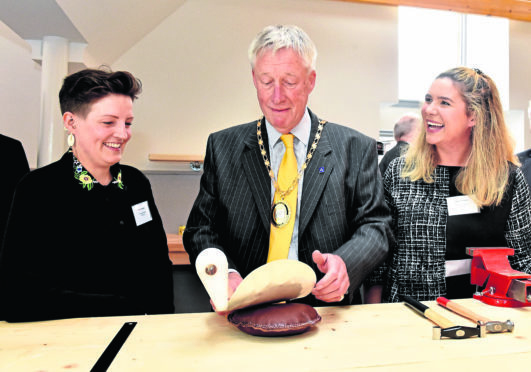 Lord Provost Bill Howatson with Kate Pickering (left) and Megan Falconer. The document lists financial details relating to the assets such as the annual income and maintenance costs. It will be published on the Aberdeenshire Council website and will be reviewed every year. The draft report which will be considered by councillors at the Banff and Buchan area committee next week shows the fund had assets worth over £1.5million. This includes the Deveron Terrace field, Banff Links, the Greenbanks Gypsy Traveller Site, Airlie Gardens and the Old Smiddy. It is the first asset portfolio to be compiled in Aberdeenshire, and the area committee will be asked to approve the document on Tuesday. wish to see them used going forward. “A Banff Common Good Officer Project Group was set up in 2015 to review assets relating to the Banff Common Good Fund. “Extensive work was carried out at that time to establish what were and were not common good assets in Banff. “Banff councillors have also had concerns for some time over the clarity of the Banff common good assets and income and expenditure relating to those assets. “This is the first such portfolio in Aberdeenshire therefore the committee is being asked to approve the document. The public was recently asked for their views on the Vinery in Airlie Gardens common good site for ideas on how the glass building could be brought back into use. Another, St Mary’s Car Park on Low Street had £8,361 spent on it from March 2017 to March 2018. Parking charges brought in £7,332 which, as the portfolio explains, will be used to offset the cost of repairs and maintenance. If approved by the area committee, the portfolio will be published by council officers on the council website.